ATA Lodge is a family owned and operated lodge on the fabled Alagnak Wild River of Bristol Bay, South West Alaska. Wayne (myself) and Jacob (my son) are the onsite owners, who together with Sue (my wife) are your hosts during your visit at the lodge. We, together with the rest our family (Cameron and Megan) and staff, are dedicated to making your stay at ATA one that you will remember and cherish the rest of your life. ATA is situated on the remote banks of Alaska’s first ever designated Wild and Scenic River. Our location on the Alagnak Wild River makes ATA Lodge the perfect wilderness fishing retreat. Boasting a world-famous run of all five species of pacific salmon, the Alagnak is also home to a host of resident fish as well, such as leopard rainbow trout, arctic char and grayling. This prestigious river is located within the Katmai National Park, with its headwaters in the surrounding mountains and flowing into Bristol Bay. It is also famously known as “The Branch River” for its seemingly endless braids, where 10 miles of river can easily contain 30 miles of fishable waters. 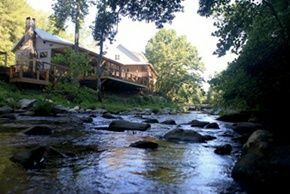 With such exclusive river access you are sure not to be bothered by any crowds. Fd: Why do you think every fly fisherman should visit your destination? For many, Alaska has always been a dream destination, somewhere they envision coming to only once in a lifetime. But once you get up here and experience all of what we have to offer, it will be hard to stay away. There is something about catching a huge Alaskan rainbow trout or salmon, surrounded by beauty beyond compare, that I believe calls to the deepest part in all of us. I would think that Bristol Bay in SW Alaska is one of those “must do” destinations that has to be on the “Bucket List” of every fly fisherman on the planet. I know it was for me! And once I got a taste of it I was “hooked”! Now I own one of Alaska’s premiere fishing lodges on one of the most highly esteemed and prolific sport fishing rivers in all of Alaska – the Alagnak Wild River of Bristol Bay! The remoteness of of our location, ensures that it is a true pristine wilderness area, far away from the crowds and any modern intrusions. No combat fishing to be found here. You can spend most days without seeing another fisherman! This is a true outdoors man's paradise, with crystal clear rivers full of a diverse and wide variety of hard fighting fish that are eager to grab a well-presented fly! And we have well over 100 miles of 3 rivers accessible by jet boat right form our lodge, with no need for expensive fly outs to find good fishing. What more could you ask for! For the unindoctrinated who have never heard of Bristol Bay, you could be forgiven for not realizing how this region stands head and shoulders above the rest. Those “in the know”, have discovered that Bristol Bay, in Southwest Alaska is hands down, the best fresh water salmon and trout fishing on the planet. And the Alagnak Wild River stands proud among it’s peers as a “Gem in the Crown” of Bristol Bay. Fly fishing in Alaska is more than just a sport or passion - it’s a way of life. And like me, once you have been bitten by the bug, you’re “hooked”. So beware – fish the Alagnak River at your own peril, because once you’ve been there, once will never be enough. This is attested to by our many clients that come back every year to get their “fix”! A stay at ATA Lodge provides you with one of the most remote and stunningly beautiful locations on the planet to experience the very best of what Alaska Fly Fishing has to offer. Whether it be the sensation of a 35+lbs King Salmon pushing a double handed rod to its limits or seeing a 26-inch rainbow trout rise to crush a mouse pattern tied the previous evening or just the feeling that no one has ever fished these beautiful waters before; it has to be said that fishing on the Alagnak River is something very special. It brings us back to the reason we started fishing in the first place when we were children. For the sheer joy of it! For the thrill of a tight line, and the sound of a reel's drag screaming! Catching fish is just a bonus and catch them you will – in great numbers and variety. We are home to what is one of the largest runs of all five species of pacific salmon to be found in the same river anywhere in the world. ATA Lodge has the unique privilege of offering the sport fishing enthusiast, one of the most dramatic dream destinations on the planet to target not only all five species of Pacific salmon, but also leopard rainbow trout, arctic grayling, arctic char, dolly varden, lake trout and even northern pike! While at ATA Lodge, you will have to constantly remind yourself to stop and appreciate the scenery because the fishing is so great. You may have heard the saying “it’s called fishing not catching”; but a stay at ATA Lodge can often seem like catching! Fd: During which months is the season open over there? We are open for business from June the 8th when the river opens up to angling after having been closed to protect the trout during their spawning activity. We are then open through late September. Although this is only a short period of time of approximately 14-15 weeks, you would be amazed at how the season changes from one week to the next. You could actually come up to us 4 or more times in a single season at feel like you are fishing a different river. That’s how much the fishing on the river changes with new fish moving in to the river from June through September. In June, before the salmon arrive, we have some of the very best trout fishing found anywhere! This is perhaps my favorite type of fishing and preferred time to be on the river. Why is that? Well, for the dedicated trout fisherman, June may well be considered the very best time of our season to come and fish both dry flies and streamers for leopard rainbow trout and grayling. We definitely consider it the very best time of year for "mousing" up rainbows (and some grayling for that matter). This is when we like to skate mouse patterns across the surface for exhilarating top water action! Then by the end of June we start to see the first “scouts” of the Sockeye Salmon run entering the river. The Sockeye run last season continued all the way through mid-August! The next species of salmon to join the parade will be the King or Chinook Salmon. These river monsters average 18-25 lbs with fish up to 55-60 lbs a real possibility. The Kings will start to enter the river in late June, building in numbers and moving upstream in to our part of the river by mid-July. Chum Salmon are the next to arrive around mid-July and then they are joined a week later by the Pink Salmon on even numbered years like this year (2018, 2020, 2022, etc.). We will start to catch good numbers of sea run char by this time as the egg drop starts in August. Fishing for other “egg eaters” like the Trout and Grayling is phenomenal at this time as well. August is a great time to catch a real “mixed bag” of fish, often catching 6, 7, 8, 9 or even up to 10 different species of fish on a single day! The first Silver Salmon (Coho) start to join the party the very end of July, but we don’t consider ourselves fishing for them until mid-August, and they are still coming in to the river and building in numbers when we close our doors for the season around the end of September. September is considered our trophy rainbow trout, grayling and char time as they have fattened up on the eggs of so many salmon spawning in the river. We are switching over from drifting beads to swinging articulated streamers in flesh patterns for the big trout at the end of the season. Silver Salmon (Coho) fishing remains excellent throughout the month of September! Multiple years of healthy, big runs for all our various salmon species bodes well for the Alagnak Wild River! We anticipate that fishing will only get better, if that is possible, and our system will continue to fish well for years to come. Abundant food, in the form of salmon eggs, flesh, fry and smolt will continue to sustain this world class fishery for resident species such as leopard rainbow trout, arctic grayling and char. All those spawning salmon mean that future runs should also remain strong into the foreseeable future as this natural spectacle and “cycle of life” on the river continues! Fd: How does one get to the lodge? After booking your flight to Anchorage (ANC) you will need to arrange a flight from Anchorage to the town of King Salmon (AKN). You know when you are flying into a town that is named after the fish you have come to catch, that you are definitely in the right part of the world! Only 3 commercial airlines fly to King Salmon regularly: Alaska Airlines, Pen Air and now this year Raven. All guests are requested to arrive at King Salmon airport by 9:00 am on the day they are scheduled to start their week at ATA Lodge. This means that they will need to either arrive on one of the first two flights out of Anchorage in the morning or arrive the night before and stay overnight in King Salmon at a local hotel. As there are no roads out to ATA Lodge. Guests will need to take an Air Taxi flight that we will arrange for them from King Salmon to the Lodge. These flights will land on our own private airstrip on the property. 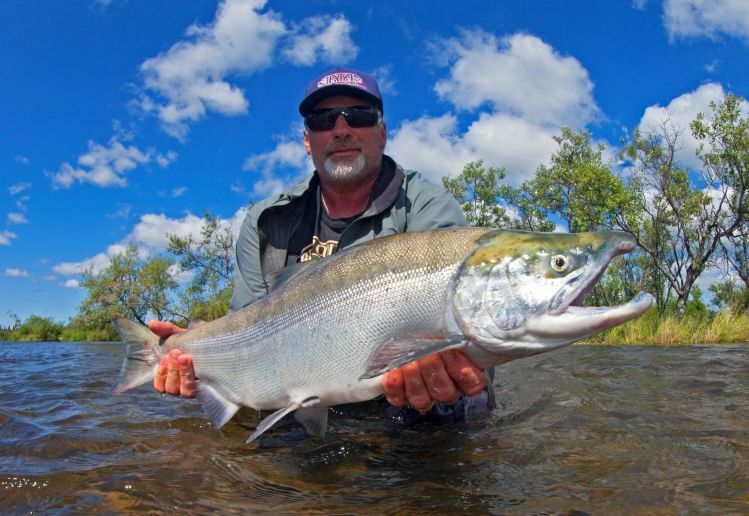 Flights to ATA Lodge start in the morning around 10:00 AM from King Salmon. A friendly local air charter service handles all flights to our Lodge. There is fee of approximately $300 pp for the roundtrip journey. All of our pilots are highly experienced and their aircraft meet the strictest safety regulations. So just lean back and have your camera ready for an incredible flight over the Katmai National Park. On departure day we strongly encourage our guests schedule a late afternoon flight out of King Salmon back to Anchorage (after 3 pm). This is advised in order to not miss their connecting flights, as I’m sure you can imagine, weather can occasionally cause delays in Alaska. Fd: What kind of fly fishing techniques are the most usual? The techniques we use vary according to a number of factors such as the time of the season a guest is visiting us; the type of fish we are targeting; as well as the conditions we encounter in the different parts of the river we may be fishing. There are times when Dry Fly Fishing is very effective for trout and grayling. Skating top water patterns on the surface of the river at certain times of the season is an exciting tactic when targeting Trout or Silver Salmon. Swinging streamers is a favorite technique as well. Other times we might try nymphing tactics. Or during the egg drop, drift fishing with a bead or egg imitation can be a very effective method. So, as you can see we employ many different techniques at different times and for different species. At various times we will either fish from the bank, or wade off of one of the many gravel bars and islands that dot the river. Other times we may find ourselves fishing from the boat, either drifting or anchored up at certain spots. These varying situations will require different techniques and equipment to be successful. Our guides, who are all US Coast Guard Captains as well as experienced fly fishers, will be able to advise and assist clients according to their individual needs. We have all the rods, reels and set-ups that you will need available at the lodge in order to ensure a great day on the water whatever species you are targeting or conditions you may encounter. Fd: What kind of fly-fishing gear should anglers take for a week over there? Dry fly fishing is primarily employed in June before the salmon arrive. This is a great time to target both rainbow trout and grayling. Anglers will mostly be using a single hand rod for this of 5-7 weight with a matching floating line. As the salmon start to move in, different conditions may demand either a single hand or double hand rods of varying lengths from 9-14 feet and of varying weights from 8 to 10 weight with matching lines. Your choice of rod and line also depend on the species of salmon in question and whether you are fishing some of the larger channels or smaller streams and braids. We will primarily use a floating or sink tip line. But it is a good idea to have on hand a wallet full of different sinking tips of medium to fast sinking rates that can be added to your line as the situation demands. As you can see there is plenty of variety and the fly fisherman who prefers to use a single hand rod or the angler who would rather spey cast, will both be happy. Fd: What are the top 5 flies that should be included in our boxes? Once again this will depend on the type of fish you would be targeting and the time of year you will be on the river. Dry flies that we use a lot for trout and grayling include Elk Hair Caddis, Parachute Adams, and Chernobyl Ants. My favorite mouse pattern is the Moorish Mouse, but the Mister Hanky is good too. For the salmon (and trout), articulated lead eye or cone head Bunny Leeches, Dolly Llamas, Hareball and Polar Hareball Leeches are all good producers as well as various Intruder type patterns in pink, fuchsia, chartreuse, blue/black; chartreuse/blue, blue/purple, pink/black, black, and olive; Egg Sucking Leeches in black, purple, and olive are good choices. For some top water action, especially with Coho, you should tie up some pink Polywogs and Wogs. Trout/Char patterns include Leeches, Sculpins, Zuddlers, and Sculpzillas - both articulated and non, either cone head or lead eye, in black, olive, and tan. I like to fish Stone Flies at certain times of the season too. Of course, when the egg drop is in full swing in August, in order to “match the hatch”, you will have to have a selection of beads in various color variations and sizes from 6-12 mm. And then later in September we switch over to flesh flies, but in greyish and dingy white colors with just a tinge of orange or pink, and not the brighter orange and pink most often associated with flesh flies when shopping for them at your local fly shop. This color will more accurately match the color of the decomposing flesh of the dead salmon now in the river. Fd: How's the programme for a typical fly-fishing day? Our general policy is that clients will go out together with 1 other angler per boat and their guide for the day. So the normal client/guide ratio is 2 clients to 1 guide. We can accommodate groups of 3 who want to fish together as well. After breakfast, your guides will be waiting for you at the boat harbor with their boats prepped and ready to whisk you up or down the river around 8 am for a full day on the water. You will spend an incredible day of fishing on the river, taking your lunch when you want, and then fishing some more until you are expected back at the Lodge between 5 and 5:30 pm. After that, you are welcome to spend more time fishing if you so desire by wading near the lodge. Fd: How is the lodge in terms of accommodation and facilities? All of our guest cabins, including the main lodge have spectacular views of the Alagnak river. Our welcoming wooden cabins are mostly en-suite, equipped with a toilet, vanity and hot showers. The cabins are heated and have power that will guarantee your stay will be a comfortable one. Our general policy is that each cabin sleeps only 2 people. But we have a couple of cabins that are set up to accommodate a family of 4 or even up to 5 family members, if they would like to share. The Dining Lodge is the centre piece of the camp. This is where we take our meals, share stories and socialize after a day on the river. With lounge sofas, a fireplace and a stunning view of the river and surrounding mountains, this building really is the town hall of our little village. Wooden walkways connect all our private guest cabins (8) to each other and lead down to our naturally sheltered dock where a fleet of jet boats are ready to access all the best fishing spots within minutes of the Lodge. The Swiss Chalet on the hill, is perfect for larger parties accommodating up to 8 guests comfortably and in style. There you can take in the “Million Dollar View”, where you can survey the rest of the property, river and mountains beyond. The lodge offers some of the finest cuisine in the Alaskan wilderness. Each morning begins with a hot breakfast. For lunch, you’ll choose from an array of meats, cheeses, and condiments, so that each person can construct their perfect deli sandwich. Your guide will keep your sandwich, along with a variety of snacks and refreshments, in his cooler until you are ready to eat lunch. Guides can also prepare shore lunches during the Salmon season if this is your preference. Appetisers are served at 5:30 p.m. daily on the lodge’s deck where you can view the river and share “Fish Stories” of that day’s most memorable highlights. Dinner is served at 6:30 p.m. and dress is casual. The dinner menu includes Prime Rib, Baked Salmon, Grilled Lemon Pepper Chicken, Italian or Mexican Night and Barbecued Baby Back Ribs. A complimentary glass of Wine is also included with dinner. If you have any special dietary needs, please let us know in advance, so we can accommodate you. The Lodge itself is on 160 acres of prime river frontage in an iconic section of the Alagnak River known as the “Braids”. The only access to the Lodge is via bush plane, landing on a private airstrip located on the property. If you choose to stay connected to the “outside world”, we have a satellite Wi-Fi internet connection available as well as a couple satellite phones you are welcome to use. But we would encourage you to leave your cell phones and laptops at home and enjoy our stunning scenery, abundant wildlife and experience a type of world class fishing that has always filled your dreams. Fd: How long before should anglers contact the lodge for reservations? We have become a very popular destination, with many return clients who are re-booking every year or every second year. Therefore, we are increasingly finding that people need to be thinking about booking their week with us up to 2 years in advance. This way you can ensure that you get a bed during the week of your choice. For example, this season we are running at near capacity and are already 65% full in 2019 (with 4 weeks already fully booked)! Over 30% of our beds are filled in 2020 at the time of this interview. Fd: Any other advice for those visiting your area? Make sure that you bring a good camera! We are the chosen venue for a number of world renowned wildlife and nature photographers that host photography workshops at our lodge every year. You will want to be sure to capture the many special “moments” that you will experience while with us on the Alagnak Wild River at ATA Lodge (not to mention a few photos of those big fish you will be catching)!